Earning third place at the Worldwide Youth in Science and Engineering (WYSE) regional competition February 8 were Mater Dei WYSE team members (from left) Max Harad, Chih-Yu (Kelly) Yeh, Nick Wolden, Raphadson (Hong) Saraputtised, Justin Fritch, Kata Bowen, Phusana Suwannachote, Abby Kay, Jaden Meadows, Mai Khuc, Morgan Berndsen, Carly Etter, Madison Stone, Alexis Patton, Lauren Wuebbels, and Abby Brandenburger. 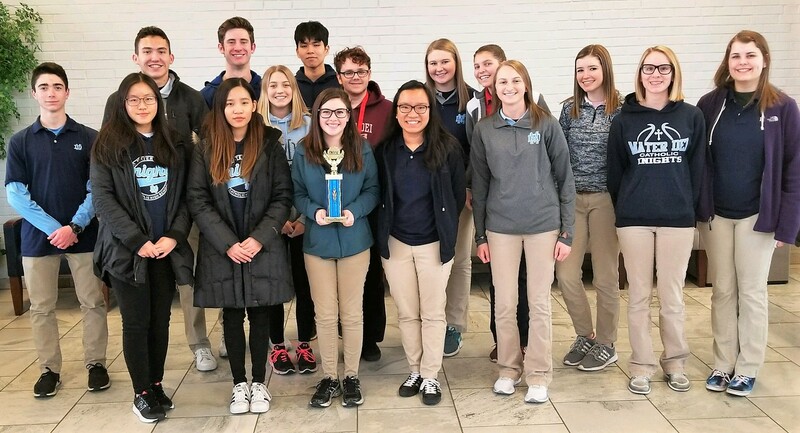 The Knights also earned several individual awards: Mai Khuc – 1st place in physics and 2nd place in math, Jaden Meadows – 2nd place in English, and Max Harad – 2nd place in biology and 3rd place in math. Mai, Jaden, and Max will compete in the sectional competition at McKendree University March 12. Please join us in congratulating the WYSE team members and moderator Mr. Scott Timmermann.